Those of you who follow this blog will see that I’ve been on a bit of a fish kick lately – that’s because I’ve been busy with fish cooking classes and some freelance assignments about fish (look for Buzz in the ‘burbs in May or Edible Front Range in July). But I’m finding that I like the lighter dinners along with the lighter evening hours – hope you do too and I’d appreciate you letting me know. 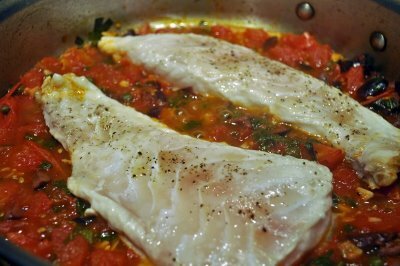 I created this red snapper (actually grouper as Whole Foods didn’t have red snapper) braised in a puttanesca sauce to photograph for an upcoming article. 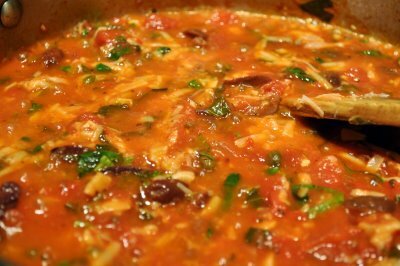 You create the sauce in a skillet, then nestle the fish fillets in the sauce, cover the pan, and let it quickly braise. After I shot the photograph I returned the sauce the the pan and added a little prepared marinara sauce (about a cup for the two of us) and some grated Parmigiano Reggiano cheese (even though the Italians would consider it almost a crime to use cheese with a seafood dish), and stirred that all together. 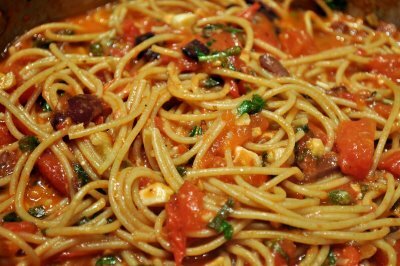 I finished it with some whole wheat spaghetti and then served that with the fish on top. what could be substituted for grouper? 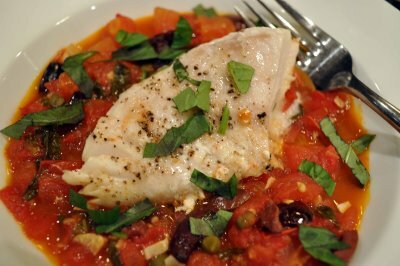 The recipe was written for red snapper – actually any firm white fish would work just fine!